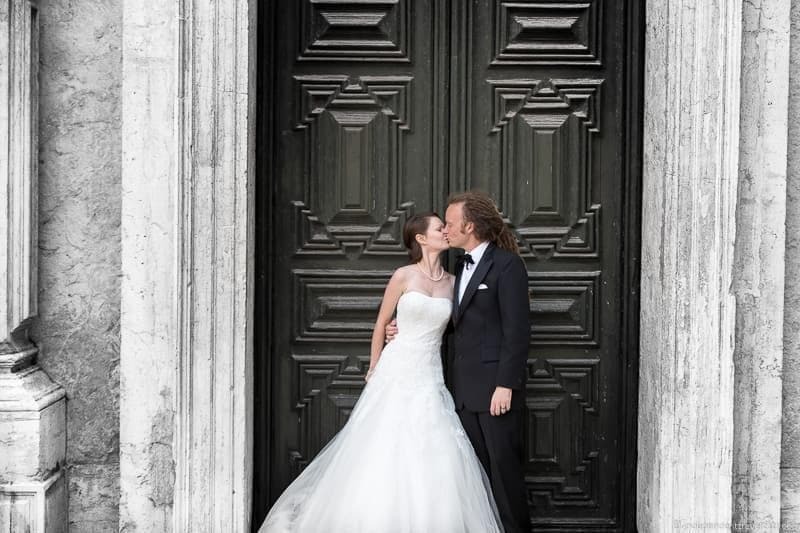 A photo essay of our wedding in Venice. Two years ago today, Laurence and I got engaged at Point Reyes National Seashore in California next to a giant elephant seal. At that time, I was working full-time as a clinical psychologist and living in the San Francisco Bay area. A lot has changed since that time. 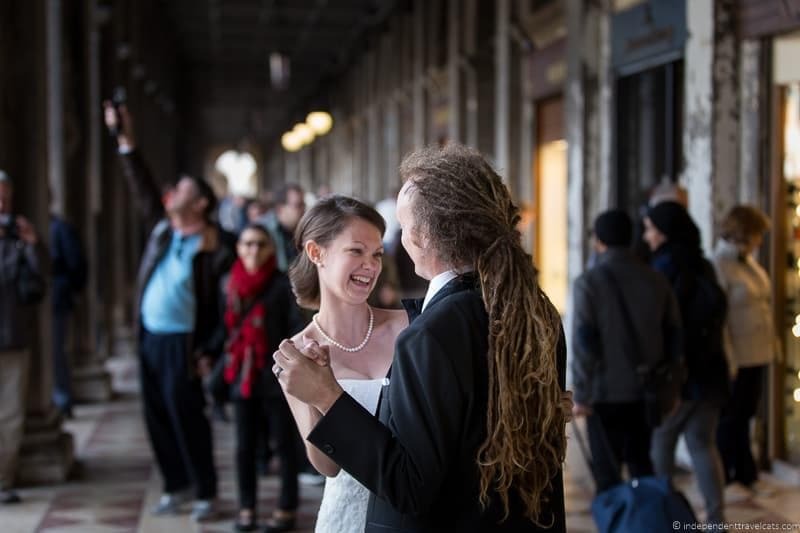 I don’t share a lot of personal posts but I’ve been asked several times to share some photos of our wedding in Venice on the blog, and have always meant to do so but never got around to doing it. So I thought I would do it today on our engagement anniversary. It also gave me a good excuse to go back through our wedding photos. 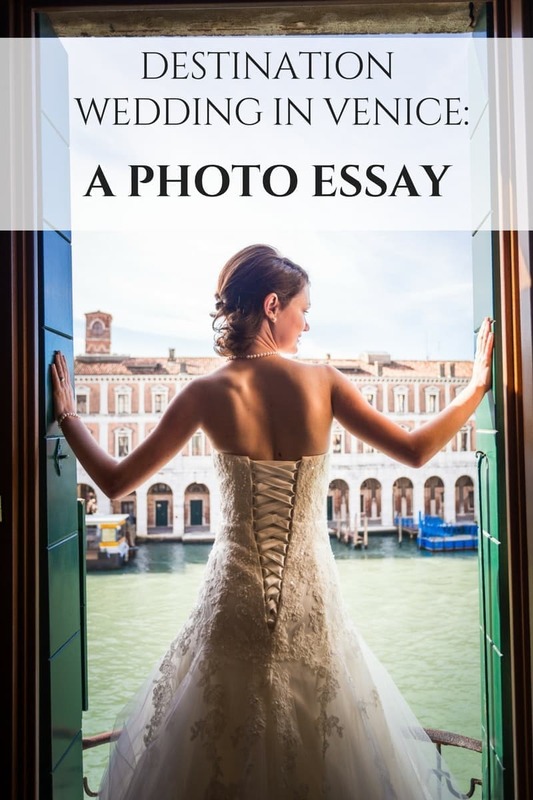 If you don’t enjoy wedding photos, this is your time to escape, otherwise, enjoy! 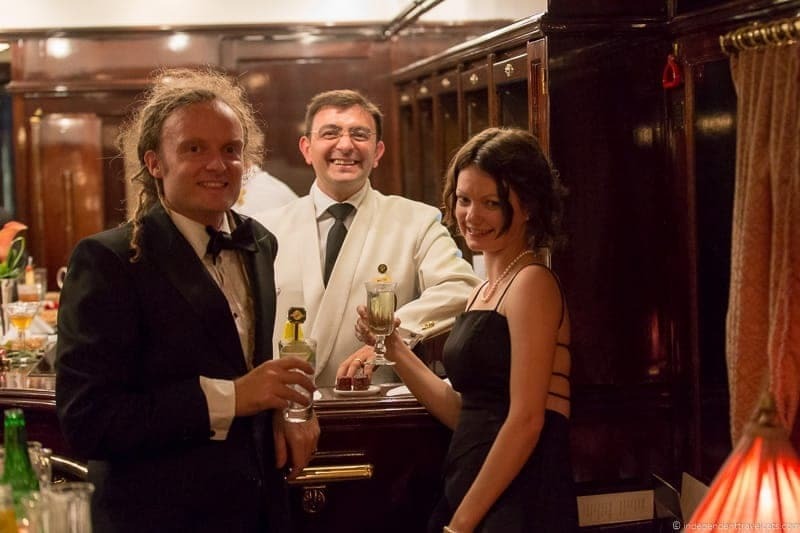 As some of you know, Laurence and I actually had our legal wedding at sea aboard the Queen Mary 2 on a voyage between New York City and Southampton, England. We had decided to get married in between our two home countries (United States and the United Kingdom) and we were in the midst of moving to Europe at the time. So we decided to combine our wedding and our move into one trip! 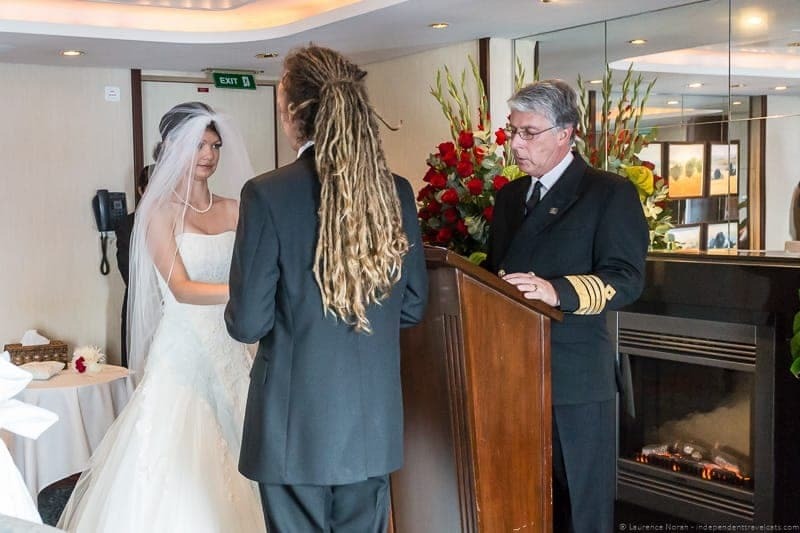 You can read more about our Queen Mary 2 wedding in an earlier post about weddings at sea. For that wedding, it was just the two of us and we did not have any guests. However, we decided to plan a wedding ceremony a couple of months after our legal wedding to be able to celebrate with some of our family and friends. Since no one lived in the same country, let alone the same city, we decided to have it in Italy as it was relatively close to those in Europe and Africa. 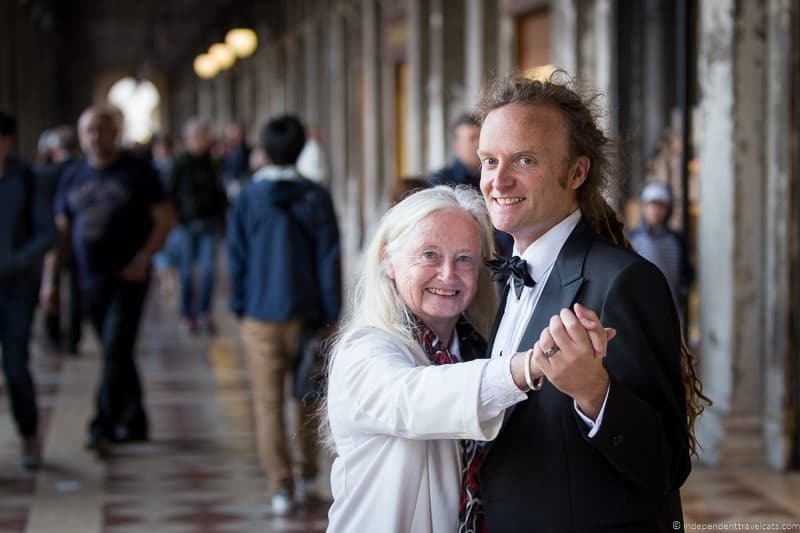 Laurence also had very fond memories of visiting Venice as a kid with his family although I had never been to Venice. 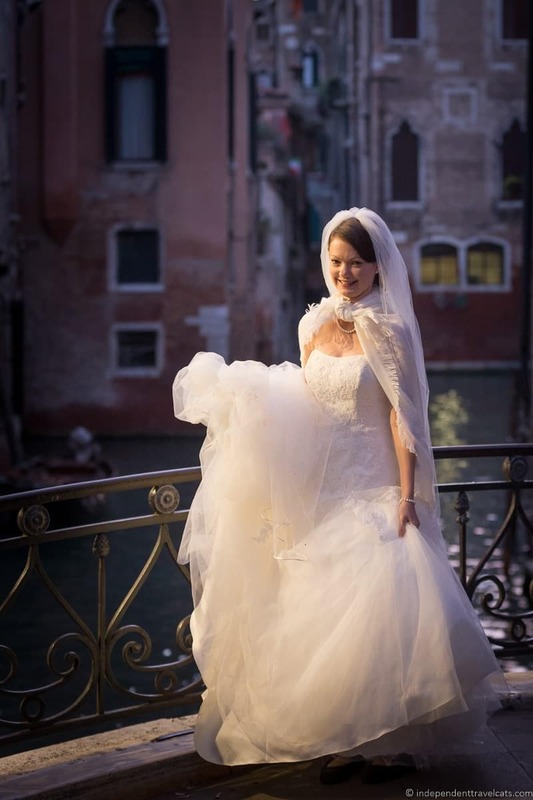 But we hoped for the best and decided to have a wedding in Venice. 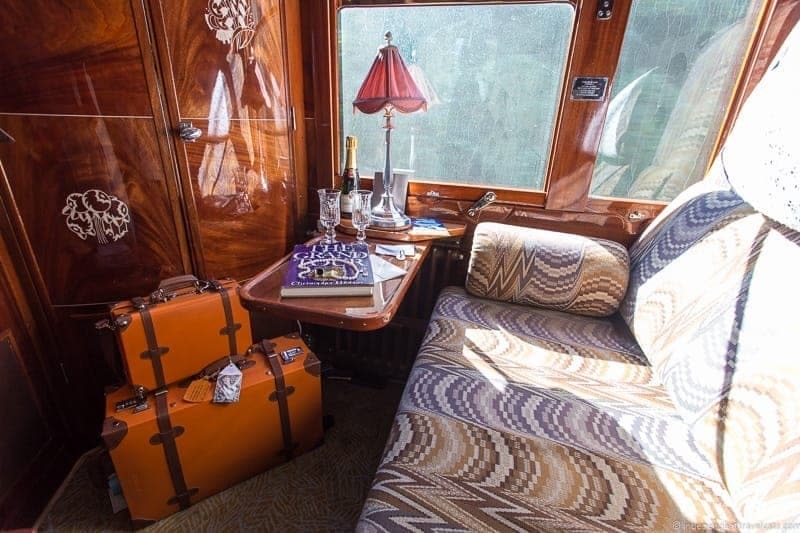 Laurence and I actually arrived into Venice on the Venice Simplon-Orient-Express train, which was a fabulous and luxurious way to get from London to Venice for our wedding. We were met by Laurence’s parents and then checked into our hotel. I loved our hotel, Locanda Leon Bianco, which was historic and charming. It also came with giant rooms! Then we had dinner with those who had already arrived in Venice for the wedding and then an early bedtime. We were lucky though as we had the next day free so we could explore a little of Venice, catch up with some of our guests, and also do some last minute wedding preparations. Half of our guests had never been to Venice before (including me! ), so it was fun to have time both before and after to explore the city. 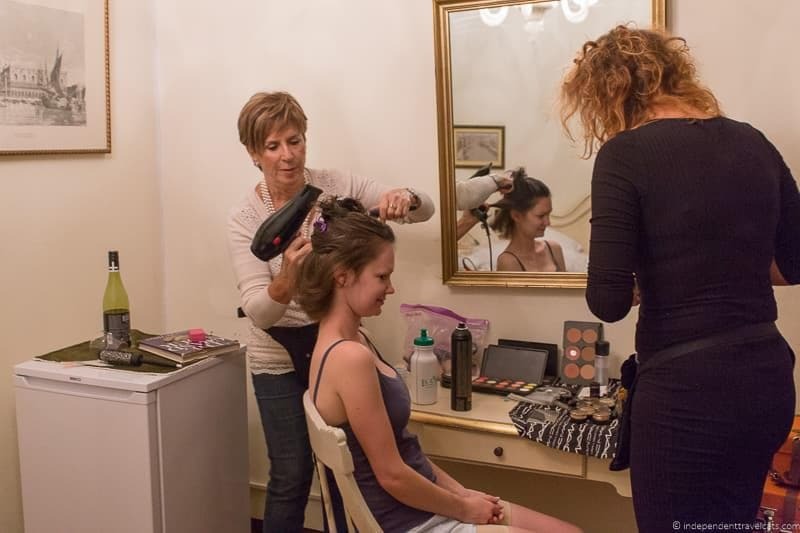 One of the biggest logistical issues we had for our wedding (at least on our end) was finding a salon that could do formal hair and make-up before our wedding. We got married super early in the morning and we knew that it would take at least an hour or so for someone to do my hair and make-up. We contacted many salons and either they were not open or the prices were too expensive for us. We finally found someone at Parrucchieri Trolese Art Hair Studios who helped us arrange for two wonderful women (Barbara and her colleague) to come to my hotel and do my hair at 6:00 AM. They were on time and did a fantastic job in a very short time period despite a curling iron issue. Highly recommend them if you need salon services while in Venice! Then I quickly got dressed with the help of these kind ladies so we could head to the ceremony location. One great thing about having a second wedding ceremony is that those wedding things you think you’ll never wear again, you get to wear them all again! It was cold so we tried to wrap me up as best as we could, which in the end just meant tying a shawl around my neck. 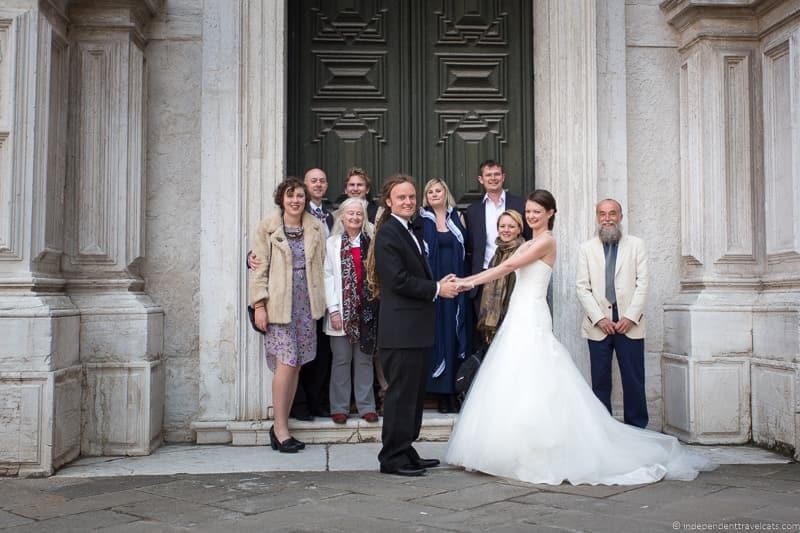 We did the actual ceremony in Piazza San Marco (a.ka. 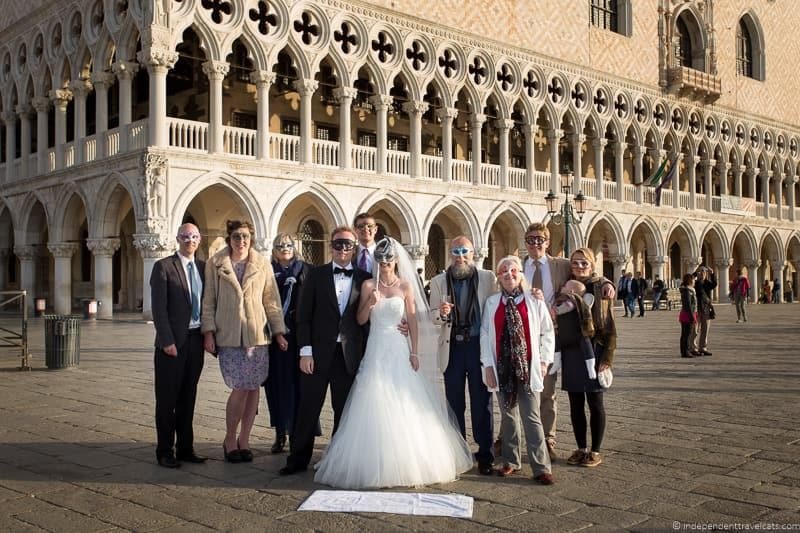 Saint Mark’s Square) and it was amazing to walk into the square and only see our small wedding party and no one else there! 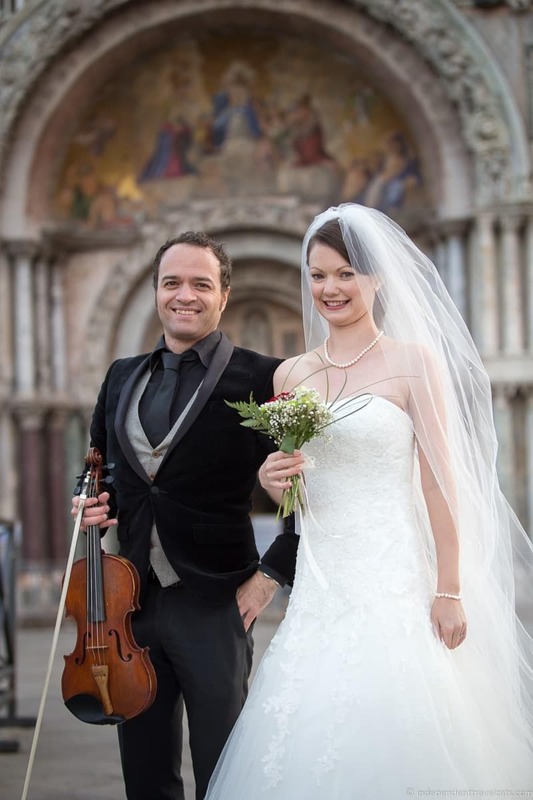 We also were surprised to find that our friend Brian, the officiant for the wedding, had hired a local violinist to play to us before and after the wedding! During the ceremony we repeated much of what we had said on our legal wedding on the Queen Mary 2, but Brian also added in some extra bits. Everyone that attended, including us, chose a reading (whether it be from a book, poem, Bible, or fable) that related to love, marriage, or us and read it during the ceremony. We were very lucky as the family and friends who attended did so much work and preparation to make it a wonderful day for us, particularly Brian and our best man Ryngan. Ryngan even prepared and printed programs for everyone! By the time we finished our ceremony, people were starting to arrive in the square and we were obviously attracting a bit of attention. So we headed off towards the lagoon to find some benches and there we had some wedding champagne toasts. Some lovely words were said! There was also orange juice and pastries for those who wanted a bit of breakfast. We also presented our wedding guests with wedding favors, which were Venetian style masks. Then we took loads of photos and posed for a lot of tourists’ photos who always love to take a photo of a bride. I am purposely trying not to share too many photos of our guests as I have no idea if they would want photos of themselves on our blog! While we usually take our photography seriously, and obviously wanted some great photos from our wedding we didn’t hire a photographer. 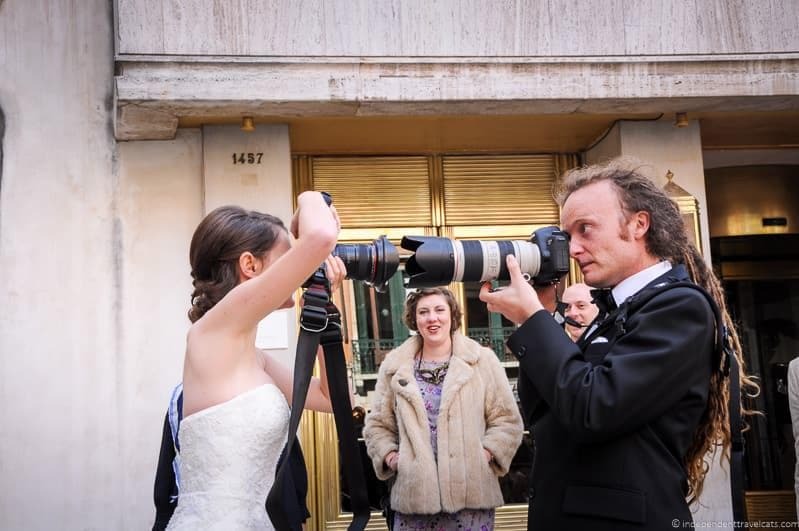 In fact, Laurence shot almost all the photos from both of our weddings. We decided that since we weren’t going to sell these photos and we just needed to please ourselves, so weren’t going to scout out locations or waste the whole day taking photos as we decided it was better to spend it with those who came to our wedding. We also handed out our cameras to guests and they took photos during the ceremony and throughout the day. We even had tourists email us photos they took of us! The photos are fun to look at as they range from beautiful photos next to canals to out of focus shots of someone’s foot! It was truly a bit of a crowdsourced wedding shoot. One thing about being in a wedding dress is that a lot of people want to talk to you, so we ended up meeting people from all over the world who wanted to congratulate us. 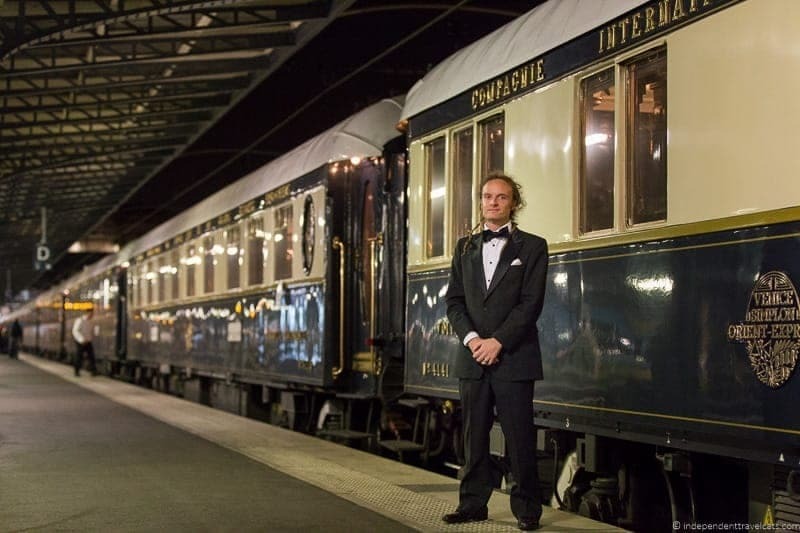 We even ran into people we had met on the Orient Express and people who had been on a walking tour with us the day before. One older man came over to us and said he’d been on the train with us and we gladly shared a glass of champagne with him for a toast. He went back to his hotel and then his daughter came out to find us, as she wanted to actually verify how her father had come back with a glass of champagne so early in the morning! We also had another couple from Taiwan take our photo in Venice and a week or so later we ran into them again in the Vatican while we were in Rome. Such a small world! After a lot of photos, we stopped for a coffee break. Some people decided to take off to have a nap as everyone had gotten up so early while we took some final photos. Afterward, those remaining came back to our hotel room so that Laurence and I could change out of our wedding clothes. We wanted to be comfortable for the rest of the day. We rejoined everyone for lunch at a restaurant called Ristoteca Oniga on a square in the Dorsoduro area of Venice. We had reserved the restaurant and were hosting the lunch, so I was nervous that the food might not be great or that it wouldn’t please everyone at the table. But it ended up being a wonderful lunch with lots of great Italian wine and conversation. 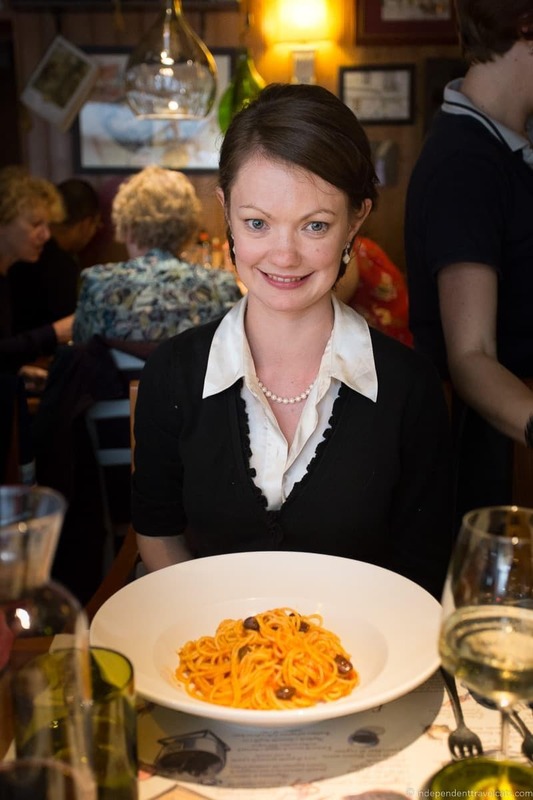 Definitely recommend it if you are looking for an easygoing traditional Venetian eatery with rustic local food. A couple of our wedding guests actually went back again the next day. 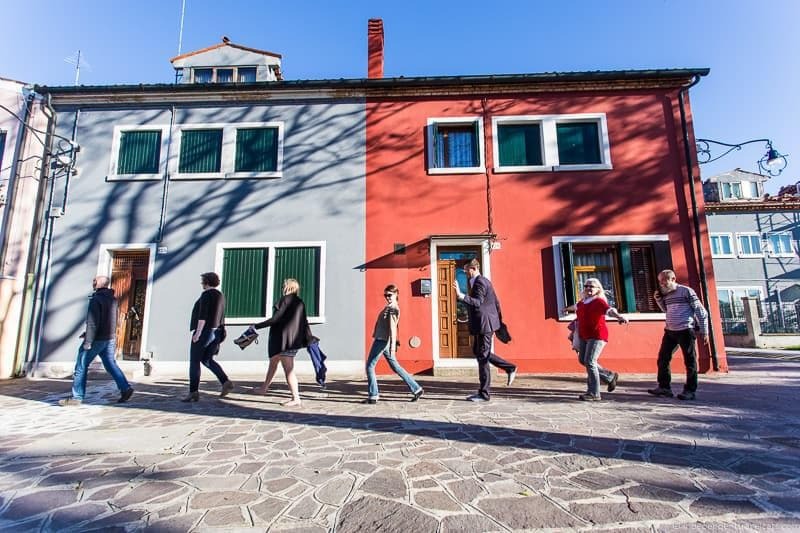 After lunch, most of us took a ferry to the island of Burano, which is known for its lace work and brightly colored homes. We spent a couple of hours on the island before heading back. Later we had dinner together. Laurence and I were exhausted, as were most of the party, but a few of the hardier souls stayed out late to explore the Venetian nightlife. It was an amazing day! 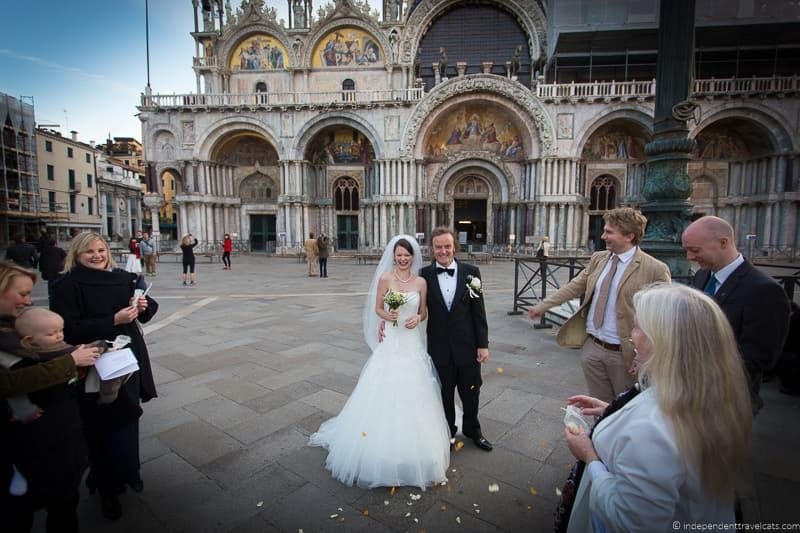 Venice is such a romantic location and was a perfect setting for our wedding. We were also very lucky with the weather although it could definitely have been a little warmer. Given that it was not a legal ceremony, we were much less stressed out or nervous about it, and the whole day was very laid back. Everyone who came for the wedding stayed for at least a few days and since we had such a small group, Laurence and I were lucky to be able to spent a lot of quality time with everyone while we were in Venice. We are very grateful to everyone who made it a special day for us. 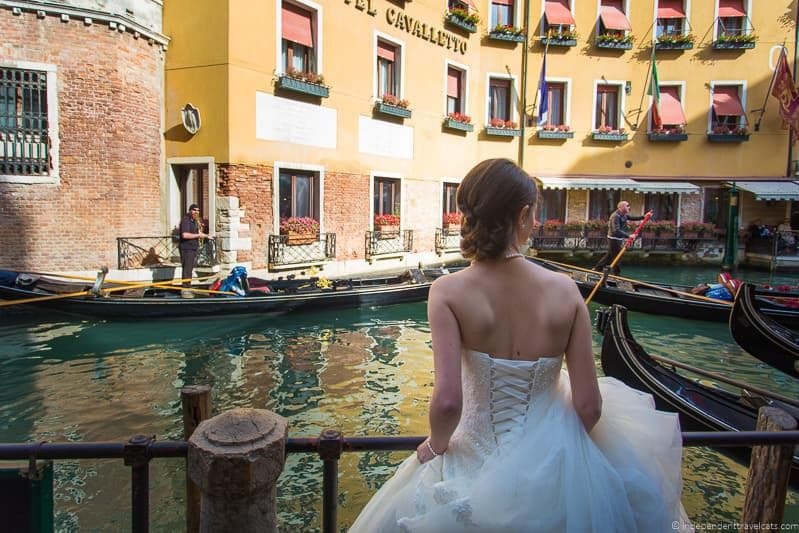 Do you Want to Plan your Own Wedding in Venice? 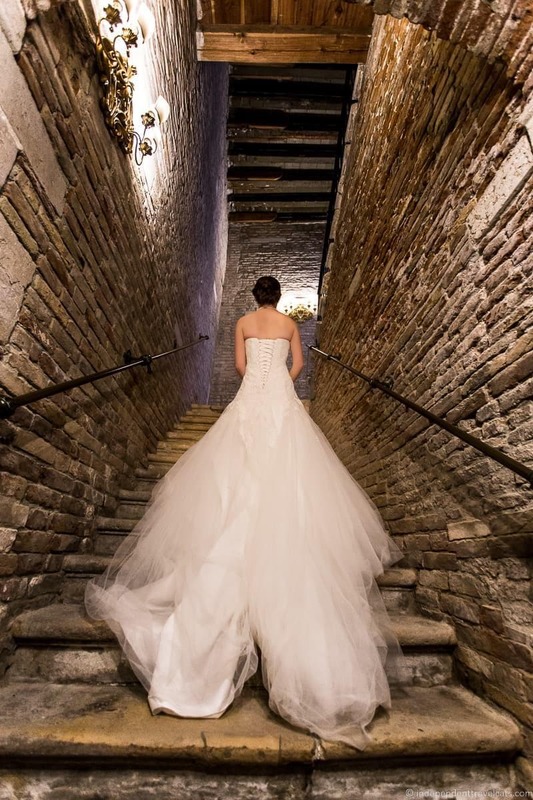 Italy is a romantic place and a popular wedding destination. 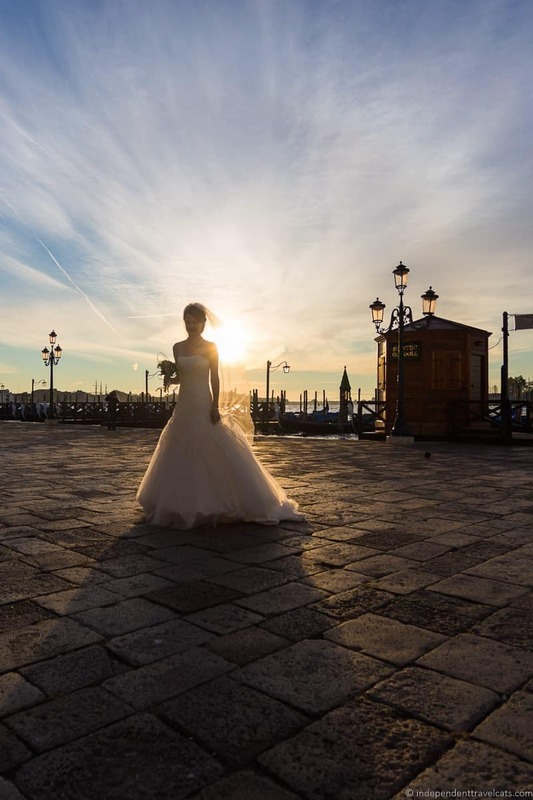 Now, if you are reading this post looking for tips on how to plan own wedding in Venice, this won’t help you much although we can recommend a good hair salon (Parrucchieri Trolese Art Hair Studios). 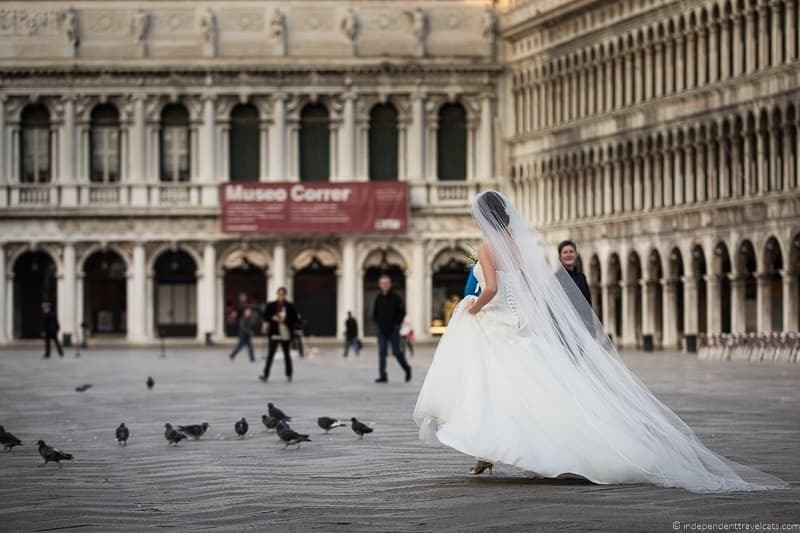 For instance I don’t believe any legal weddings can take place in Piazza San Marco although weddings can be arranged in the crypt of St. Mark’s Church! 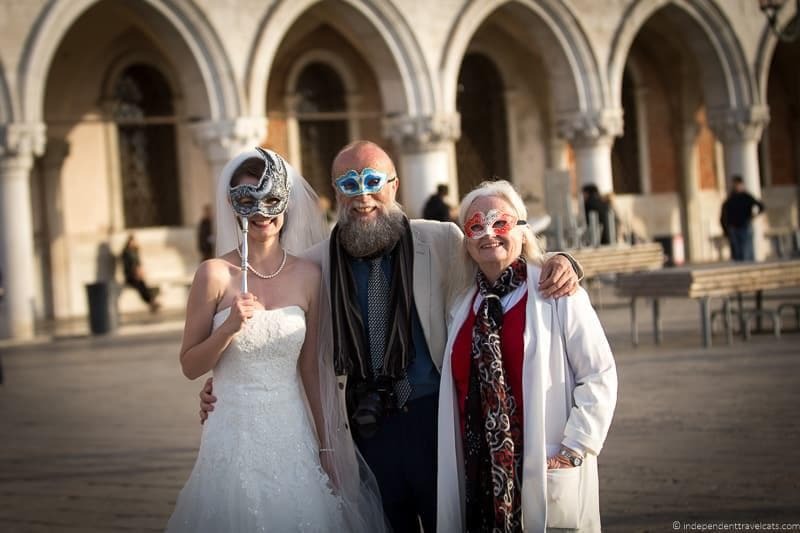 We actually did some research into having a legal wedding ceremony in Italy (as well as in several other countries) but the legal issues and restrictions outweighed the benefits for us. 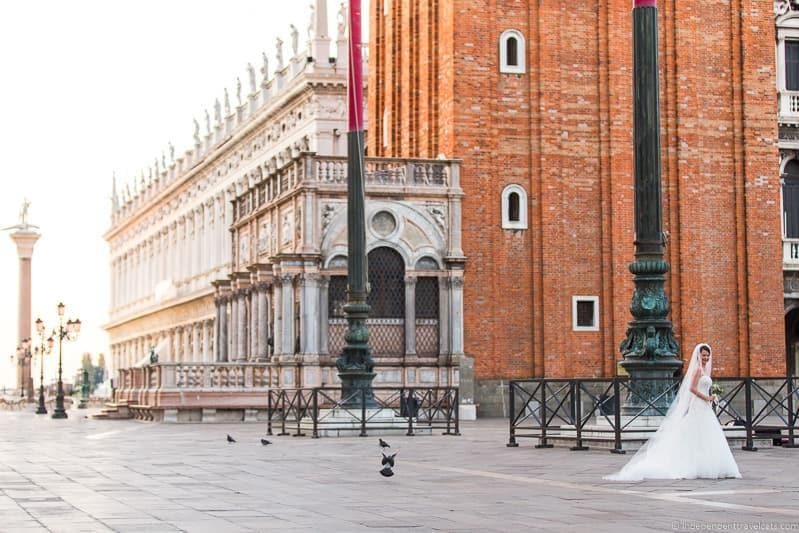 Note that there are different procedures for civil and religious ceremonies in Italy, and also the requirements vary widely depending on your nationality. Start your research with your own country’s legal requirements and then check out those for Italy. 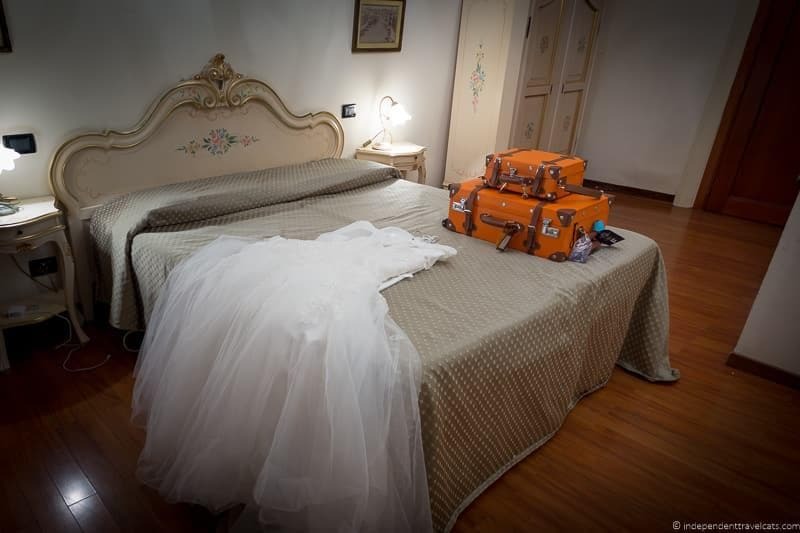 We’d definitely recommend considering a wedding planner familiar with destination weddings in Italy to make sure everything runs smoothly. 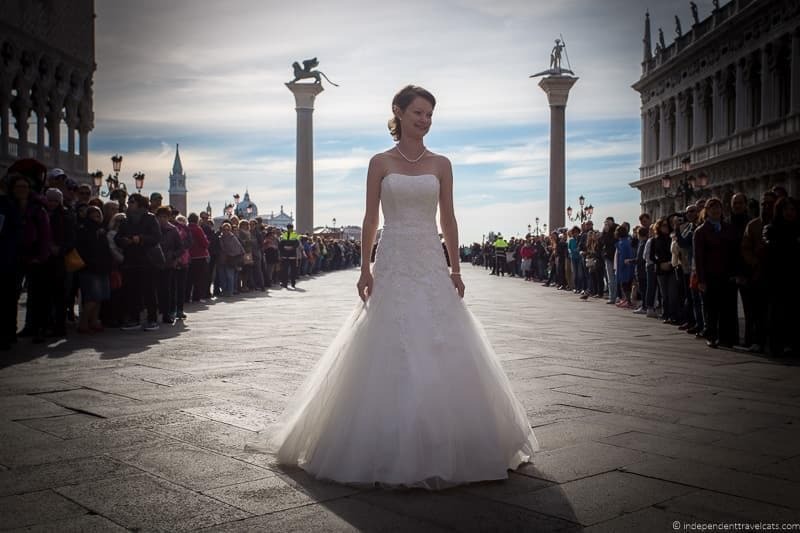 So there is our wedding in Venice! Hope you enjoyed it and feel free to share a little of your own wedding story in the comments below. As always, we welcome your comments and are happy to answer any questions you may have (about our wedding in Venice or otherwise). Hello Jessica, you both are just looking awesome in your wedding dress. The photos you shared are superb, I loved it. 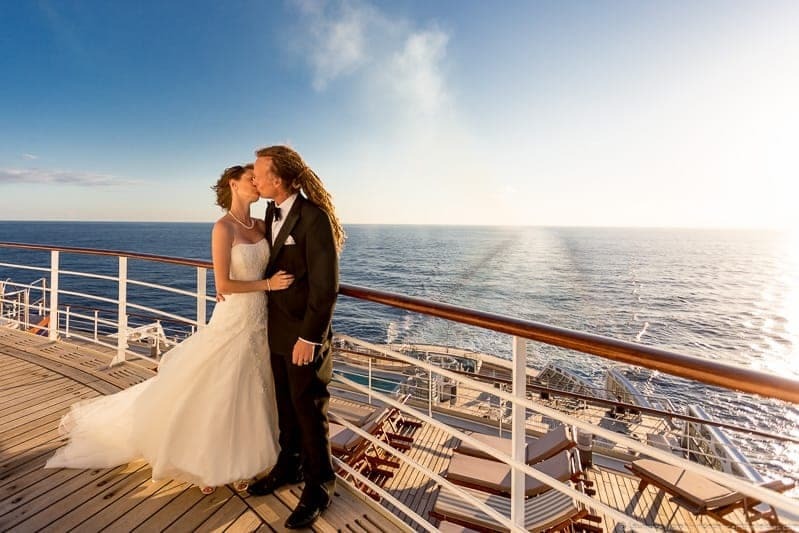 Thanks for sharing your memorable wedding moments with us. You guys look so cute. These photos are amazing! I recently planned my sister’s wedding and it was awesome. I found a great event planning software that really saved my life. It made all the planning much easier. I also chose to work with a seating plan software and it really saved a lot of spends. Thanks and congratulations you two! 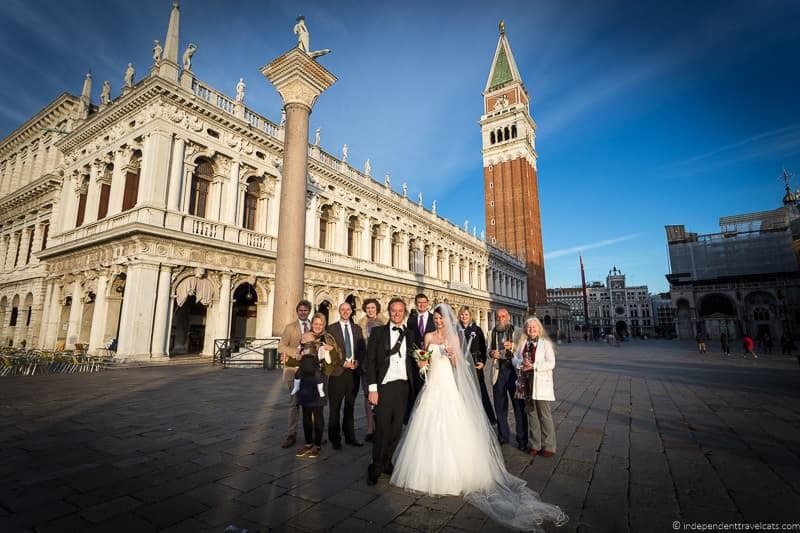 Thanks for sharing your wedding in Venice! Loved it. And you dress is amazing. 🙂 Just the best for you. Beautiful pictures! Venice is wonderful! 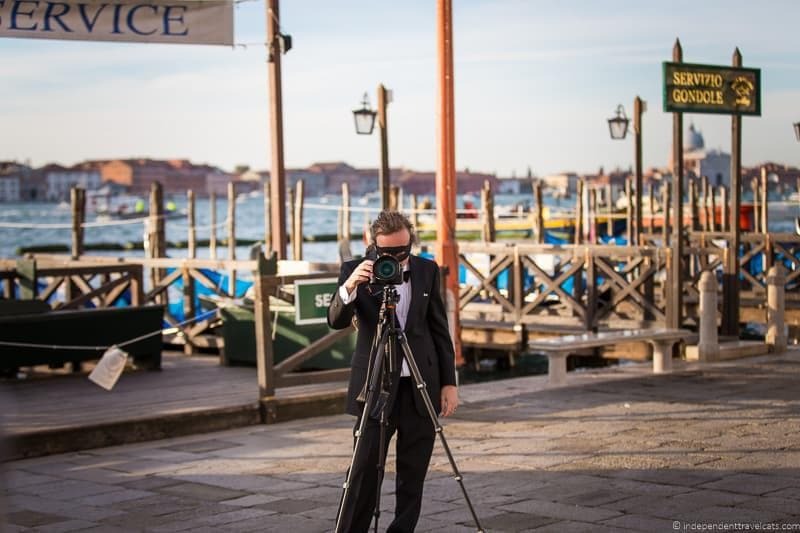 The pictures of your wedding ceremony and time in Venice is awesome and thanks for sharing these wonderful and beautiful pictures! The wedding dress is very pretty – I love such designs that give such elegant look to one who wears it. Keep sharing more stories! Gorgeous photos of a lovely couple. How special to have a 2nd wedding with your family and close friends. Steve and I married 6 years ago and only had a small ceremony and had special readings from our two best friends. Our honeymoon was our first trip overseas together, even more special travelling the first of our many trips as man and wife. your pix brought back memories for me…. James & I were in Venice in April of 2001, (the year after we married on the Big Island in Hawaii) although hardly seems that long ago. It’s a beautiful city and one I’d love to share with my daughter some day. All the best to you… keep up the excellent work! Awww… congratulations, and thanks for sharing this little window into your life. You look stunning, and I love the ribbons down the back of the gown. What a special idea to marry early in St. Marks before the crowds had gathered. Spontaneous and precious. I wish you many blessings!! Thank you for posting this with all the lovely photos, it brings back lots of happy memories of our time together.